The story opens with the narrator, Annie, and her best friend, referred to through most of the narration as Adam, going back-to-school shopping with Annie’s mom. Annie didn’t want to go shopping with a “boy,” but her mom forces her to “be nice” and invite Adam along. While shopping Annie tries on a purple dress. Adam tries on the very same dress. Annie is not upset that a “boy” is wearing a dress, but instead that he looks cuter in it. Annie’s mother is very supportive of Adam, although his own parents are notably absent from the text. Annie and Adam both wear the same dress the first day of school, and all their peers seem to agree with Annie’s observation—it looks better on Adam! Annie begins to ignore her best friend. The heightened emotions of both children are artfully captured by Zing in illustrations that complement that text nicely. 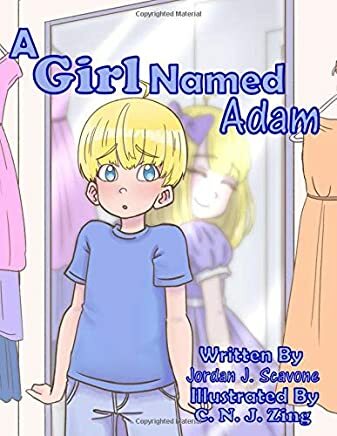 A month into the new school year, the children’s teacher announces that Adam will now use female pronouns and go by the name Addie. In an outburst she is immediately scolded for, Annie tells Addie to stop playing dress-up, and explains that she feels like her identity is being stolen. After school Annie observes Addie being bullied by a much larger child wearing dirty, torn clothing. The bully, Keith, steals Addie’s bow and makes trans oppressive comments. Annie approaches Addie and expresses her frustration and confusion. Addie then explains that she never felt like a boy and admits she does want to be like Annie. The two make up. I was quite impressed with the strength of both the illustrations and prose. Zing’s illustrations provide access to the quickly changing emotions of Addie and Annie. The choice to focus on Annie’s experience of Addie’s transition is quite interesting. Readers do not have access to Addie’s experience with her family or peers, other than Addie. However, we do see how hurt she is by Annie, which is why Zing’s illustrations are such an important part of the book. I have concerns about the classed representation of Keith, the bully, who is also ambiguously racialized with very light brown-skin as opposed to Addie and Annie’s very pale complexions and matching rosy cheeks. I mentioned this to Scavone who noted in a private correspondence that the bully was inspired by his and Zing’s own childhood bullies. Although that doesn’t void my original critique it adds an interesting dimension. This is a good book that will likely prompt many needed discussions about gender, friendship, and complex emotions. I recommend it for anyone interested in expanding personal and school libraries to include more representations of transgender children—we certainly need them! Like most books about transgender children, this one is self-published.